For those who use my aluminum sharpening system, I recently developed a support for the plates. Made from aluminum, four cap head screws clamp the plates securely, yet it is quick to switch them. The rubber feet keep it from sliding around on the workbench and help keep it clean. The height, 1.5 inches, gives hand and finger clearance when sharpening, especially when working perpendicular to a workbench. This is what I use to make all of my knives, although I have dedicated stands for each of the four grits I recommend. 1. $140.00 for the complete sharpening system. 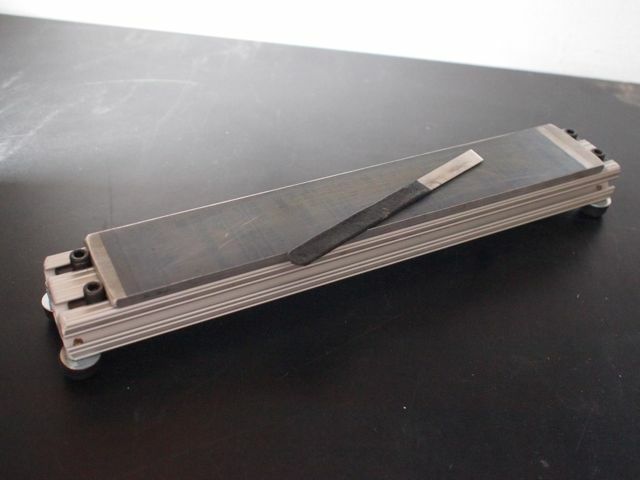 Includes: Sharpening stand, two aluminum plates, 5 strips of 2 x 11 inch 3M microfinishing film, a two sided horsbutt/ calf strop, and .5 micron honing compound . 2. $100.00 for the sharpening system without the stand. 3. $40.00 for the sharpening stand.